圖二、大鼠經肌肉注射(intramuscular injection; IM)及微針(MN)接種後之血中專一性抗體濃度。IM saline：肌肉注射生理食鹽水；IM full-dose OVA：肌肉注射全劑量抗原；IM full-dose OVA：肌肉注射全劑量抗原+幾丁聚醣溶液；MN low-dose OVA：微針接種40 %抗原劑量；MN full-dose OVA：微針接種全劑量抗原. J.M. Arya, L. Dewitt, M. Scott-Garrard, Y.W. Chiang, M.R. Prausnitz. 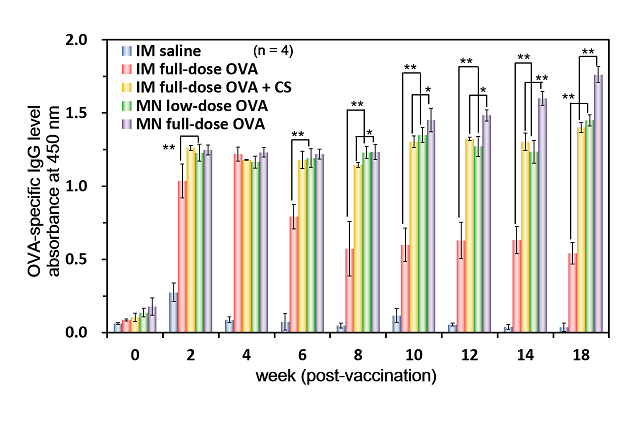 Rabies vaccination in dogs using a dissolving microneedle patch J. Control. Release, 10 (2016), pp. 19-26. E.S. Esser, A. Romanyuk, E.V. Vassilieva, J. Jacob, M.R. Prausnitz, R.W. Compans, I. Skountzou. 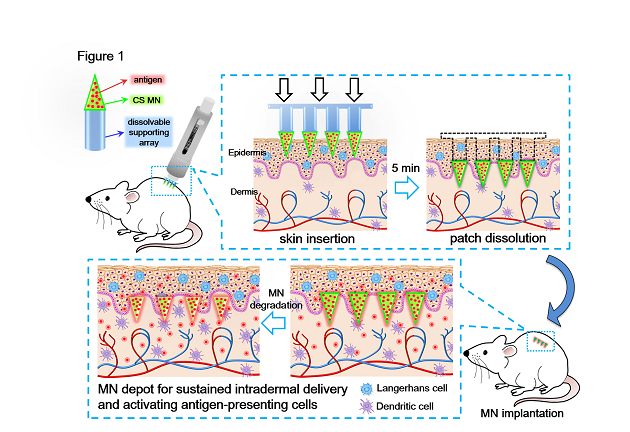 Tetanus vaccination with a dissolving microneedle patch confers protective immune responses in pregnancy. J. Control. Release, 236 (2016), pp. 47-56. Y.M. Vasiliev. Chitosan-based vaccine adjuvants: incomplete characterization complicates preclinical and clinical evaluation. Expert Rev. Vaccines, 14 (1) (2015), pp. 37-53. E.C. Carroll, L. Jin, A. Mori, N. Muñoz-Wolf, E. Oleszycka, H.B. Moran, S. Mansouri, C.P. McEntee, E. Lambe, E.M. Agger, P. Andersen, C. Cunningham, P. Hertzog, K.A. Fitzgerald, A.G. Bowie, E.C. Lavelle. The vaccine adjuvant chitosan promotes cellular immunity via DNA sensor cGAS-STING-dependent induction of type I interferons. Immunity, 44 (3) (2016), pp. 597-608.